Widespread and common throughout England and Wales, less frequent in Scotland where records are scattered and widespread to the far north (NBN) including the Western Isles and Orkney but not recorded from the Outer Hebrides or Shetland (Morris). The species is common throughout our area in just about any habitat containing unmaintained grass including domestic gardens, road verges, parks and woodland. Local populations of these weevils are almost always found to contain a mixture of P.roboretanus and P.viridiaeris and their relative abundance varies from year to year; in 2005 P.roboretanus was by far the most abundant species on Common moor and in Cassiobury park whereas from 2006-2008 they have by far the less common species, sweeping open grassland in Cassiobury park on 06/06/08 produced P.viridiaeris and P.roboretanus in the ratio of about 15:1 respectively, and this also seemed to be the case across the open areas of Radlett road. Adults appear during late April or May depending on season when perhaps the easiest way to record them is by sweeping around Crataegus at about the time the flower buds are due to open. 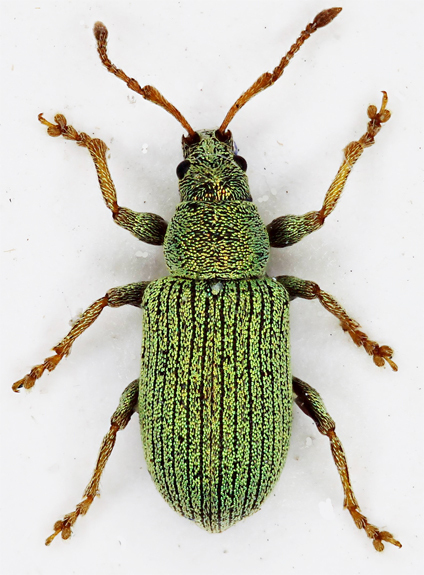 They soon become abundant on wasteland and grassland etc, the adults are polyphagous and may be found on a range of herbaceous plants eg nettles and docks, and shrubs although they are seldom taken from trees; the small green weevils often taken in numbers at this time from low Oak foliage are usually P.viridiaeris orP.pyri. Adults remain abundant through June and into July, during 2008 they were found in small numbers at the beginning of August. The larvae are subterranean feeding on a range of roots. For recording purposes P.roboretanus will need to be distinguished in the field from P.viridiaeris, the easiest field character is the ventral scaling, other characters are subtle and a little difficult to appreciate under a hand lens. 2.6-4.5mm. (Morris) Upper surface covered with metallic green, golden-green or sometimes bluish round or short oval scales, interstices with much smaller elongate and curved setae like scales which are mostly semi-erect and just visible at X20. Rostrum quadrate with raised ridges beside scrobes, scrobes generally filled with scales but obvious from above, especially around antennal insertions. Head flat between eyes, convex towards base and rostrum. Antennae testaceous, scape distinctly angled and first and second segments of funiculus elongate. Pronotum transverse, broadest at middle and weakly raised along front margin. Scutellum elongate and usually covered with scales. Elytra broadest behind middle so that striae are distinctly sinuate, very convex, side margin not visible from above, apical declivity steep. Basal margin straight, much wider than base of pronotum, with well developed humeral prominences. Striae strongly punctured and almost devoid of scales, sutural striae parallel or almost so to base, generally includng lateral margin of scutellum. Legs testaceous with femora usually a little darker. Femora without teeth on underside, with dense and elongate metallic scales. Tibiae with much sparser and more elongate metallic scales, cuticle plainly visible. Apex of protibiae obliquely truncate at apex. Abdominal ventrites sparsely scaled, cuticle plainly visible from side view but if the legs obscure this this be careful not to consider the metasternum, which is densely scaled, as part of the abdomen. Second visible sternite in male with a transverse keel near apical margin.